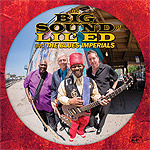 CD review: "The Big Sound of Lil' Ed & The Blues Imperials"
This review first appeared on Oct. 8, 2016 at AllAboutJazz.com. DFor more than 25 years, Lil’ Ed Williams and his three-piece Blues Imperials have been as rock-steady in their roster makeup as they have musically. Since the late 1980s, singer-guitarist Williams has been backed by Michael Garrett (second guitar), James “Pookie” Young (bass) and Kelly Littleton (drums). That kind of longevity in a band can lead in two directions: heightened understanding and interplay, or stagnation. On their new Alligator release, “The Big Sound of Lil’ Ed & The Blues Imperials,” it is the former that is in evidence: The music is clearly that of four men still having the time of their lives, still in love with the music  and, because of their longstanding familiarity with one another, better able to anticipate the others’ tendencies, to play off one another than ever before. The rhythm section of Young and Littleton provides a seemingly effortless foundation  whether it’s a driving rock-ribbed electric blues like “Black Diamond Love” and “Giving Up On Your Love,” or a slower ballad, “I’ll Cry Tomorrow,” say, or “Troubled World.” Littleton is of the less is more school - nothing flashy, just a solid beat that sets the table for Williams’ vocals and his and Garrett’s guitar leads. Young, similarly, puts his focus on the ensemble - straightforward foundational work that allows the band to immediately find and hold its footing on every song. For their part, the interaction between guitarists Williams and Garrett is akin to listening to a two-headed four-armed monster, so complementary is their playing. While Garrett is nominally the rhythm guitarist, on “I’m Done” and “Troubled World” (both Williams compositions, by the way), Garrett steps into the lead and shows a tasteful, dextrous voice on guitar every bit the equal of Williams, albeit more jazz oriented. The 14 songs here are all strong  this is only the band’s ninth studio album over three decades, and they take their time in crafting and collecting strong material before heading into the studio. In addition to 12 new originals, the band also covers two songs by Williams’ uncle, the great J.B. Hutto. Lil’ Ed & The Blues Imperials remain at the top of their art  inspired playing, strong material, and the kind of ensemble improvisation that can only come with decades spent together playing and performing night after night.